These beautiful cards are hand-crafted by a women's cooperative in Nepal - this trade is an important source of income for these women. The design is 3-dimensional using ink and real leaves, and the hand-made paper is made from rice. 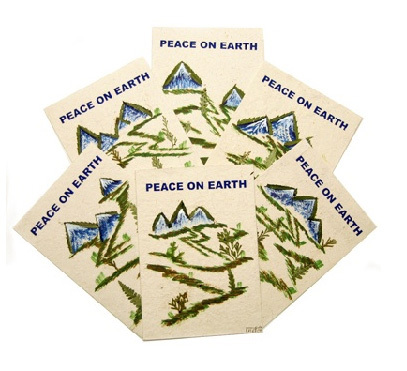 Each set comes with 6 cards and 6 envelopes, which are packaged in an handsome large rice paper envelope. Each card is signed in Nepali by the artist.